I got this creative writing prompt from a blog linkup. Everyone uses the same first sentence and writes a short piece of fiction. You know I'd be all over this. It's been a while since I actually sat down to write a fiction piece, and the exercise was quite fun even though I can tell I'm out of practice. Writing fiction is no joke. Let me know what you think! I had been looking forward to it. That was before I knew he was going to be there. I’d never been to the Richardson house, but ever since I moved to Summerset, I had heard stories about the dinner parties that were hosted there on the third Thursday of every other month. For as much as they were talked about, the dinner parties were a mystery to the townspeople. Talk was, the Richardsons didn’t invite just anyone to one of their dinner parties, but no one knew the exact criteria required for an invitation. I was delighted yet surprised when the envelope arrived. After all, I’d only been living in Summerset for four months and didn't know many people. Still, I'd heard rumors about Richardson parties, and when I saw the scrolling cursive addressed to Miss Evangeline Harper, I knew an invitation was inside. For three weeks, I counted down the days. I bought a new dress and practiced what I was going to say to Mrs. Marla Richardson. I pictured making my grand entrance to the stately old house on the hill at least a hundred times. Everything was going to be perfect. Then, the day before the party, I got a phone call. It was from him, telling me he was going to be at the Richardson dinner party too. After we ended the call, during which I had barely been able to say anything beyond a few mumbled words, I stood in my kitchen and stared at my phone in shock as the setting sun wove twilight shadows across the tiled floor. “How did you find me?” I whispered to the empty room. The sun suddenly dipped below the horizon. Then the light vanished, and I shivered. I was wondering if you were going to do this one! 'setting sun wove twilight shadows' mmmmmm girl, that's good stuff right therr! Ooooh, I love it! So, are you going to write the rest of the book? How DID he find her? what is going to happen?! HOW DID HE FIND HER?! what did he do...why is she running. Umm hello amazing writer!! Loved this little taste of writing! Oh you are so good. Lovely piece, lady! You're gonna finish writing this, right? Oooo! I love it! Can you make a part two? ohhhh I love it! I want a part 2! Such a fun little read, well done! Ooooh, I like this. Who is HE?! I think you need to add to the story every week! how can i be at this party?! you are good girl. And then what happened?? Are you just going to leave us hanging?? I'm loving everyone's take on this prompt! You have me wanting more!!! I wanna know what happens! I love it I love it I love it! Why the shiver? Who is he?! That was so good, Amanda! 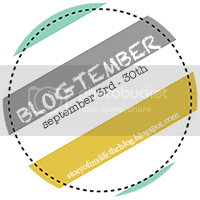 I actually wrote on this same prompt (I totally did the Blogtember challenge, too!) but definitely didn't write in the same direction. You should totally revisit this fictional piece or just write more fiction in general. That last line (and even the last paragraph) has me begging for more!